At least one third of our lives is spent sleeping on a mattress. Add in time spent reading, watching television, cuddling, nursing, and playing on one and the amount of time that we spend on our mattresses increases significantly. If you think about the activities that take place in the bed, be it a bed you sleep alone in or one that you share with another adult and/or children, you will see how a mattress needs to be refreshed every now and then. Many mattress are found to contain sweat, blood, urine, and other bodily fluids, along with dirt and dust. Some without a good, natural moisture barrier also contain mold and mildew. 1. Start with washing all of the bedding including the mattress protector. In order to insure that any nasty germs are killed off, add about 10 drops of tea tree oil to your laundry detergent. Tea tree has been proven to kill off everything from the flu virus to MRSA! 2. Vacuum the mattress in every crease and crevice with the upholstery attachment. This will get rid of any dead skin cells, dust and other debris that have made their way there. 3. Mix some baking soda with 10 drops of tea tree oil and 10 drops of lavender oil. You can use a mason jar, shaking the mixture to combine the oils with the baking soda. Sprinkle the mixture over the bed and let it sit for a few hours. The baking soda will neutralize and odors and absorb any moisture. The oils will help to kill any germs on the surface of the mattress. 4. Vacuum up the baking soda once again using the upholstery attachment. 5. Spot clean any stains. The stains on mattresses are usually those of body fluid, and if you are finding them after freshening your mattress for the first time, then they have most likely been there for a while. You may not be able to fully remove them at this point, but here are some recipes to try. Please note that you do not want to get a lot of fluid on your mattress, so use as little as possible when cleaning it. For blood: Make a paste of 1/4 cup hydrogen peroxide, 1 tbsp liquid dish soap and 1 tbsp of salt. Rub it in, let it sit and then scrape it off. For urine and sweat: Mix 3 tbsp baking soda into 8 ounces of hydrogen peroxide with 2 small drops of dish soap. Mix until the baking soda is dissolved and dab this on the spot. For vomit: Make a paste using hydrogen peroxide and baking soda. Set it on the stain, let it sit and then scrape it off. If you needed to do any spot treatments, wait until any damp spots on the mattress are dry before putting any bedding back on. When you are sure that your mattress is dry from any spot cleaning, put all of the bedding back on and relax knowing that you will sleep ‘fresh’ tonight! Our newest product is now available for you to purchase just in time for YOUR new arrival! We are very excited to offer the My Green Crib mattress made with organic cotton and natural wool for just $249 with free shipping. It’s important to know that not all crib mattresses are made the same, and that choosing a crib mattress warrants careful consideration. You know that new babies need love, attention, nourishment, and up to 18 hours of sleep each day to grow up healthy. We want to keep your baby safe and as close to nature as possible when he is sleeping all those hours (fingers crossed). Many conventional mattresses are made with dangerous flame retardant chemicals and petroleum based foams that off~gas and can cause sleep disturbances, allergies, and illness. We know you want something better! Like us, you want to offer your little one the most non-toxic and natural products you possibly can. At My Green Mattress, we now offer our customers a crib mattress of the highest quality, handcrafted with an organic cotton and natural wool quilted cover. The wool acts as a natural flame retardant meaning your baby won’t be exposed to any dangerous flame retardant chemicals. We use a heavy batting of organic cotton to provide your baby comfort and a natural night’s sleep. 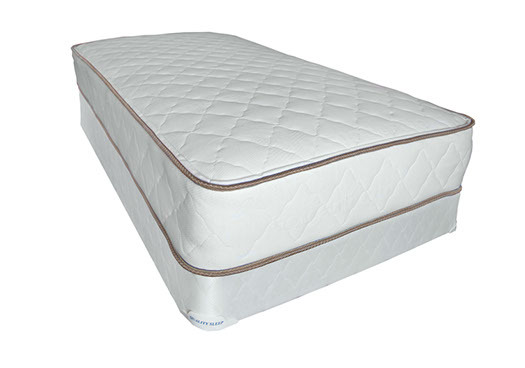 The mattress contains a firm 150 coil innerspring unit with a supportive edge. (Recommended by the Consumers Safety Commision – http://www.cpsc.gov//PageFiles/129289/202.pdf) And, we’ve made the mattress two-sided for longer wear and the ability to flip it in case of an accident or spill. All of our My Green Mattresses are proudly handcrafted in the USA. Each crib mattress is made to order and shipped to your doorstep via Fed Ex within 7 days. We’re very excited about our new arrival and we hope you are too! It seemed timely to us, with the current conditions in our job market and many people struggling to find work in what were once great manufacturing areas of the county, to write our story and speak to the “why’s” of what we do at My Green Mattress. Everyone is familiar with the trends in manufacturing over the last 20-30 years that have deployed many manufacturing and production jobs and businesses overseas. 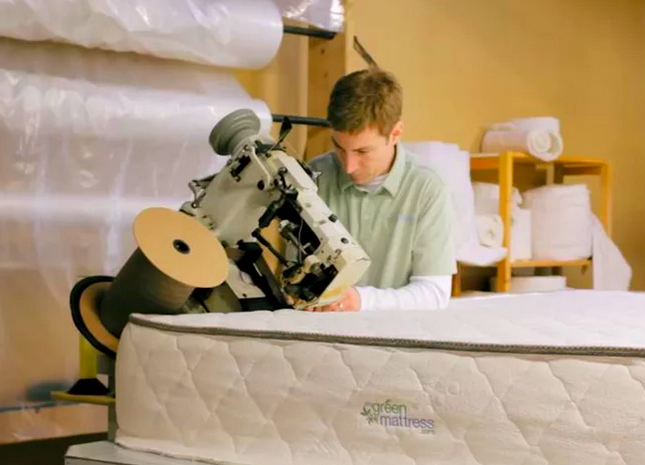 At My Green Mattress, we have not only extended a legacy of an outstanding local business in Illinois, but have helped suppliers nationwide by way of our purchasing practices and commitment to finding the finest organic and natural inputs, sourced almost entirely here in the US. The story begins with Tim Masters, founder of My Green Mattress. Tim attended Township High School in La Grange, Illinois, and shortly after, took a mattress crafting apprenticeship under the tutelage of Mr. Brixie, owner of Quality Sleep Shop, a local mattress manufacturer that began business in 1969. Tim was honored to work with Mr. Brixie, who to him was a businessman of exemplary order; he was honest, and a true “stand-up guy,” in Tim’s own words. The art of making mattresses spoke to Tim from the beginning, he loved that he could create something tangible, be innovative and work with his hands. He also enjoyed fixing the machines in the shop and ensuring the entire manufacturing process ran smoothly. After five years of honing his craft, Tim decided that he wanted to open a mattress factory of his own. When he approached Mr. Brixie with the idea, Mr. Brixie happily sold him Quality Sleep Shop, saying he could not continue the business without Tim. And so, Tim carried on the traditions in craftsmanship and an heirloom local business, maintaining local jobs and even created more. My Green Mattress employs 11 people, some who have been with the Company for 11 years. Together, Tim and his workers carefully create each mattress by hand, each made to order. To make the perfect mattress, they maintain time honored techniques, taught to Tim by Mr. Brixie. As a full cut and sew factory, they hand quilt the fabrics with a multi-needle quilter. Cotton batting, natural latex and wool are all carefully layered over an individually wrapped innerspring coil system, covered, then closed by a tape edge machine. The quality of all materials and their craftsmanship are controlled from top to bottom of the mattress. The result? The perfect mattress. Tim has taken great care in discerningly selecting all of his material inputs, and our customers can rest easy knowing that almost all of these materials were sourced right here in the US. Our steel components for the innerspring systems and box springs are from Hickory, North Carolina, our fabric also hails from the South, cotton from Fort Wayne, Indiana, and foam is sourced in Omaha, Nebraska. US based companies, large or small, depend on companies like My Green Mattress, to maintain and grow prosperity. Tim and his family are very proud to offer a product made with the finest US sourced organic and natural inputs, made in their hometown of La Grange, Illinois. It has now been 25 years since Tim started making mattresses, and his dedication to creating the perfect mattress is still evident as he continues to work side by side with his employees every day, making mattresses and speaking to his customers to ensure they each receive the perfect bed. At My Green Mattress, the product isn’t just a mattress that feels good, we truly produce good feelings. Moreover, to offer someone a perfect night’s sleep, well, what could be better than that? The Yin and Yang of SLEEP! We make mattresses, so obviously we love everything about sleep and getting the “best” sleep possible. Here’s a great take on how to achieve optimal sleep, written by my amazing, holistic healthcare practitioner, Eutimia Cruz Montoya. You’ve heard about Yin and Yang. They represent the duality that is present in all of nature. Yin represents the female principle; it is cool, solid, yielding, dark, water and earth. Yang represents the male principle; it is hot, moving, forceful, airy, fire and sky. Everything on this earth has components of Yin and Yang. Yin and Yang oppose one another, depend on one another, consume one another, and transform into one another. Our entire picture of health depends on how we are able to accommodate the shifts of Yin and Yang within our own bodies, and within our environments. Sleep is a Yin activity. Sleep is restorative and restful. It allows for the renewal of our energy through quiet receiving. Night is also Yin. Night is dark, cool, and quiet. According to the Tao, or, the laws of how all life is interwoven and progressing, we are all always affected by the movements of our internal and external environments. The nature of every season, every food, every emotion, every sound, has an energetic pull on us, and our body, mind, spirit complex. In order for us to be without uncomfortable symptoms, the qualities of these internal and external energetic pulls must be enhancing and balancing one another. Therefore, my friends, the best, most enhancing, restorative and regenerative sleep, happens at night. That is, we get the most support from our external and internal environments, during Yin processes (like sleep) when we sleep during Yin hours (at night). 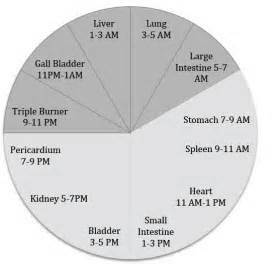 According to Traditional Chinese Medicine all organs function at their optimal capacities during specific hours of the clock. The blood restores itself at Yin time, in the Liver, between 1-3am. Yang functions, like eating, that require an active process, such as digestion, are more apt during Yang time, during the day. For example, the most optimal time to eat is during Stomach time, from 7-9am, therefore, Chinese Medicine looks favorably upon consuming a large breakfast, as the Yang energy of the morning helps to facilitate our digestive functions. If it is absolutely unavailable for you to be asleep by around 9pm, you can still create the most conducive Yin environment for your sleep. Make your sleeping space as dark, silent and comfortable as possible; make your space like a safe nest, so your body feels present and in-tune for the Yin process of sleep. If you have a hard time sleeping in general, you can add to the Yin principle of your constitution by participating in restorative practices like deep breathing, foot baths and self-massage. Yang energy, like heat, rises in the body. Therefore, generally, if we are having a hard time sleeping, we must descend Yang energy, and augment Yin energy. This can be accomplished with visualization and some lifestyle shifts. 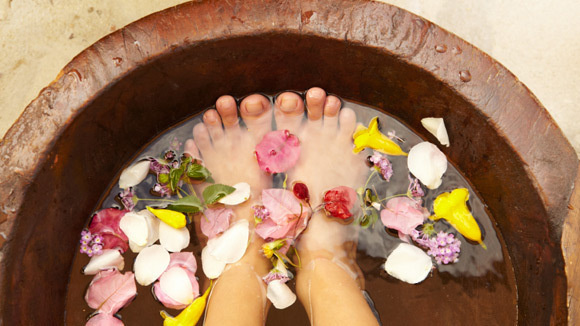 Give yourself a nightly, warm foot bath. This will both send Yang energy down, and rise Yin energy to the Yin organs, offering the feeling of calm and support, and draining the go, go, go, do, do, do from the head, for easier, more restful sleep. Do not eat before sleep! Digestion is a Yang activity. When we fill our stomach before sleepy time our system will be unable to digest to full capacity. This not only leads to unrestful sleep (with many vivid dreams), but could also exacerbate metabolic and digestive pathologies. Lay off the spicy foods! Spicy foods have a HOT quality. Once again, heat rises. If we have too much Yang energy up top, it will be harder to fall into the depths of sleep. Give technology a break before sleep. For the same reason of Yang energy activating the upper region (mind and heart) in the form of fast moving pixels, it will be easier to fall asleep after having offered a more calm (Yin) mental environment. Consume fewer stimulants. You guessed it! Stimulants are full of Yang energy! Drinking lots of caffeine and consuming nicotine or other stimulant drugs (prescriptions included) will lessen the capacity for fully restful sleep. Take some nice deep breaths intending energy downward. Deep breaths are known to slow the heart rate on their own. When coupled with intention to release excess Yang energy, and bring in calming Yin energy, our sleep will come sooner and be more restful. May your sleep be dark, quiet, restful and restorative! Eutimia Cruz Montoya is a curandera (spiritual healer), herbalist, licensed acupuncturist, and Real Foods Activist. 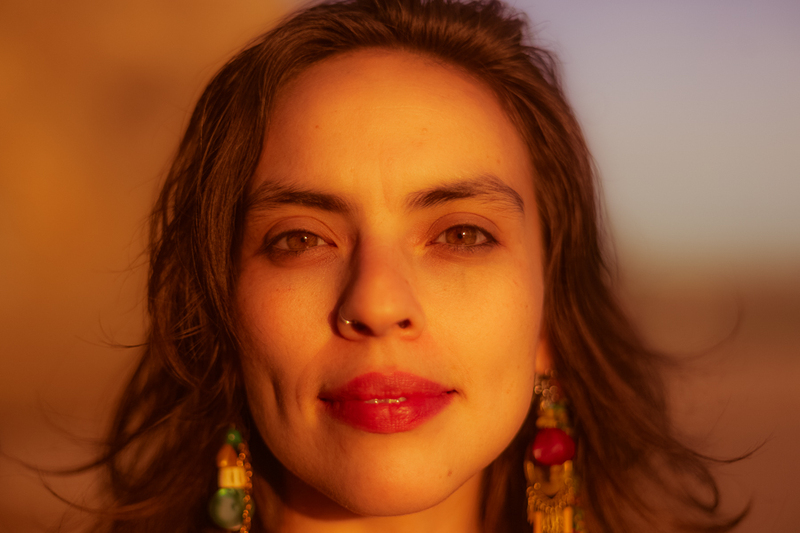 She grew up participating in indigenous American song, dance and prayer traditions, giving her an inborn connection to, and understanding of, Body and Source. Eutimia is a Stanford-trained anthropologist, and has been studying and practicing Classical Chinese Medicine since 2004. Most recently she has come home to her maternal Curanderismo (American indigenous medicine) roots and integrates all aspects of her medical knowledge in her private holistic healthcare practice in Denver, Colorado. As an educator, Eutimia is passionate about reigniting the fire of agency in Personal Well-Being through teaching the importance of environmental influences on whole body, mind and spirit health. Many consumers are contemplating whether or not it is better to buy a mattress online. For some people, it may be difficult to make such a large purchase without physically being there to do so. Online shopping has taken over the way people buy and sell goods so purchasing a mattress online has quickly become an option that many people are choosing. The benefits prove numerous, from significant financial savings to a better selection. For those that are still a little skeptical, here are the reasons to buy a mattress online. In the hustle and bustle of day-to-day life, it may be difficult to find time to go shopping during business hours. Now, consumers can simply sit down at their computer in the privacy of their homes and take as much time as they need looking for their perfect mattress. There is no need to dress-up, get the kids ready, or drive across town to a retailer showroom when you buy a mattress online. Instead, you can shop on your time and on your own terms. If you want to take days or weeks to decide, you can. At your fingertips are several resources explaining the different fabrics, materials and terminology used in the mattress industry. Consumer reviews and social media outlets also provide an insight into what real shoppers have to save about specific beds. Opting to research and buy a mattress online provides greater access to information and makes better-informed shoppers.. If you purchase a mattress online from a retailer in a different state, you typically do not have to pay that additional tax. Websites also tend offer frequent sales and promotions to get an edge over competitors (on top their already reduced prices). When you buy a mattress online, you can view countless beds and better research the ones that you think meet your specific needs. Savvy shoppers typically always compare a product’s value at different retailers when making big buying decisions. Online shopping allows people to easily click from site to site to learn more about beds that catch their eye. In contrast, comparison shopping at actual locations means hours spent driving around from one store to the next. Comparison shopping while you buy a mattress online is not only faster, but typically provides more information as well. If you want to compare 50 retailers without spending a fortune on gas, you can. Purchasing a mattress is a big investment in any person’s life. It is something that is supposed to provide you the proper comfort and support for several years, enabling you to sleep better and live a healthier lifestyle. Because of this, it is very important that consumers are able to weigh their options and research mattresses thoroughly, while saving time and money. When you choose to buy a mattress online you get all of these benefits and more, helping to ensure restful nights and sweeter dreams.